Apart from the Bank Holiday weekend, there's something that most Londoners look forward to at the end of August every year. From 30-31 August, the streets of London's prestigious Notting Hill area will be filled with street food stalls, live music and, of course, seemingly endless colourful parades. Given the amount of people attending (up to a staggering 2 million people each year! 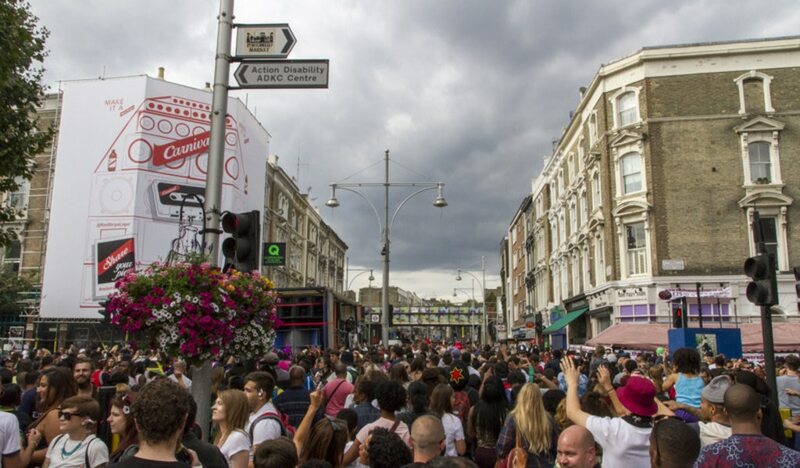 ), as well as the massive area in which it all takes place, your first visit to the Notting Hill Carnival may be a little overwhelming. In order to make your carnival as stress-free as possible, we've put together this handy survival guide. From practical information on how to get there and where to see the action to top tips from travel bloggers who've experienced it for themselves, read on for the full Notting Hill Carnival lowdown. Get ready for the parades... Image credit: Angel Ganev. Although the carnival might look like modern mayhem, the event has actually been around since 1966. Its origins are those of peace, as the carnival - which is organised by the city's West Indian community - was initially brought about to improve race relations. Fast forward from then to now, and the carnival has only been growing from year to year. Hundreds of thousands of people travel to Notting Hill to experience what is considered to be London's biggest outdoor party. Nowadays, the carnival is associated with colourful parades, music and plenty of tasty food and drink from the numerous stalls present in the area. Although several related events take place before and after the carnival, the two official days are Sunday, 30 August, and Monday, 31 August. Sunday is known as 'Family Day', which is considered to be a lot tamer and more family-appropriate; there will be children's play areas as well as other kid-friendly activities. Monday is much louder and full on - this is the party day of the carnival. Friendly faces at one of the many (many) food stalls. Image credit: Donna Rutherford. Fast Fact: The carnival's parades follow a 2.2-mile (3.5-kilometre) circuit. You can check out the official route map here. In terms of things to see, the parades are the main draw. From 10:00 to about 18:30, there will be loud, colourful parades on the go. Festival attendees line up along the parade route, taking in the bright costumes, booming music from the trucks as well as the live bands. 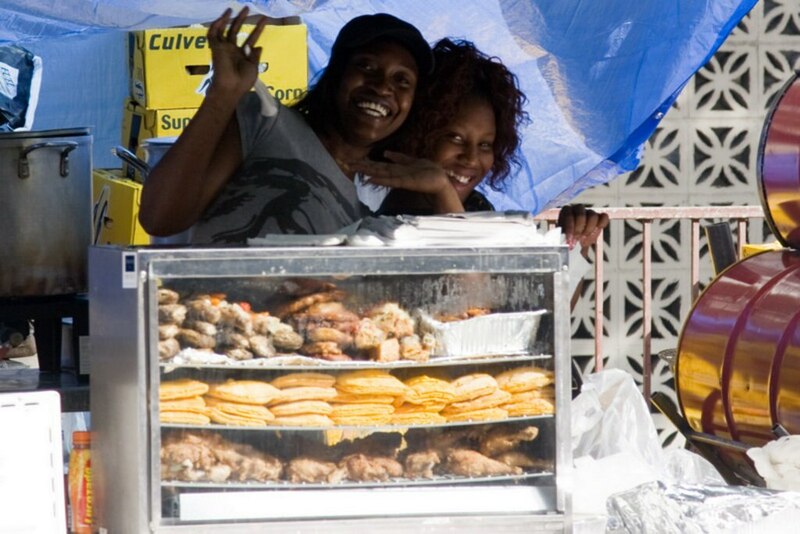 When not checking out the parades, temptation comes in the form of the food stalls. There'll be all manner of Caribbean cuisine staples - the ever-popular jerk chicken, curried goat, fried plantain and patties - as well as other dishes from around the world. Just two examples of the bright costumes you'll see throughout the day. Image credit: S Pakhrin. We've already established that there'll be plenty of noise coming from the parades, but there are also 38 stationary sound systems dotted around the carnival area. These will be playing music from different genres, so you're bound to find something good - no matter your music taste! When activities wind down before 19:00, it's then time to move on to an after-party. 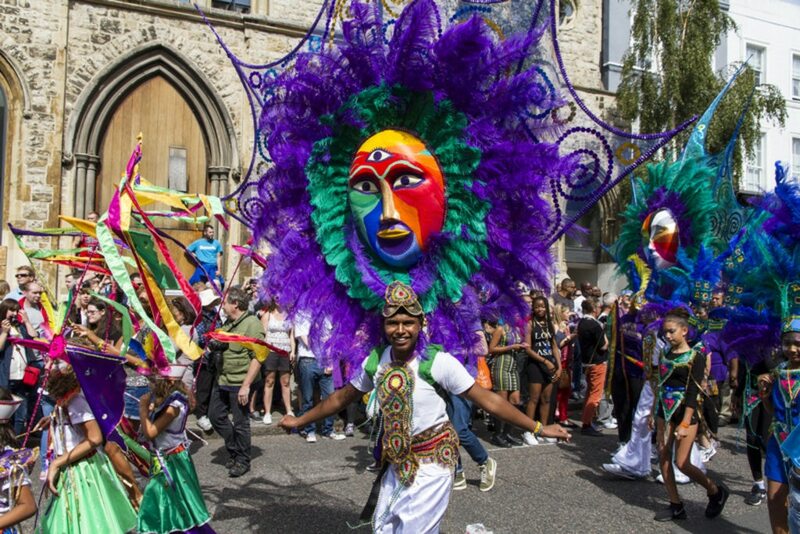 Whether you're keen on a family-friendly visit or an all-day party session, this year's Notting Hill Carnival promises to be the same vibrant, memorable and multicultural event it always has been. Most people will be getting to Notting Hill Carnival via public transport. This is definitely the recommended method, but take note that there will some significant changes to normal services during this two-day event. Bus routes will be altered, and, while there are plenty of Underground stations in the vicinity, some of these may be exit-only or closed. Keep track of service updates/delays on the Transport for London website. The crowds! Image credit: Angel Ganev. Take cash with you. We're not saying that you should take your entire life savings, but, while there are cash machines available at the carnival, most of these will run out of money long before the event is over. Be vigilant. Although crime rates are low for such a big event, keep an eye on your belongings and don't bring anything valuable to the carnival. Bring tissues! When you finally find an available toilet (these can be a bit difficult to find), they often lack loo paper. Wear open shoes. Trust us, sneakers/boots are the way to go for this one. Go with a massive group of friends - you will only lose each other. Rely on your phone. Getting phone signal has always been a nightmare at the carnival. Rather travel to the carnival together or arrange a meeting point in case you lose your friends during the festivities. Do: Look out for the live music performances during the parades. Image credit: Mark Kent. Don't forget the sound systems - whilst the parade is great fun the sound systems on the side roads are often where most of the fun is. They all play different genres of music so check on the website beforehand and scout out your favourite! I highly recommend visiting on family day. The parade is a lot more fun with all the local kids joining in, and you don't have to deal with quite so many rowdy revellers. Be sure to hit up the food trucks - I urge you to try the curried goat (the spicier the better) and the cocktails lovingly disguised in fresh coconuts. 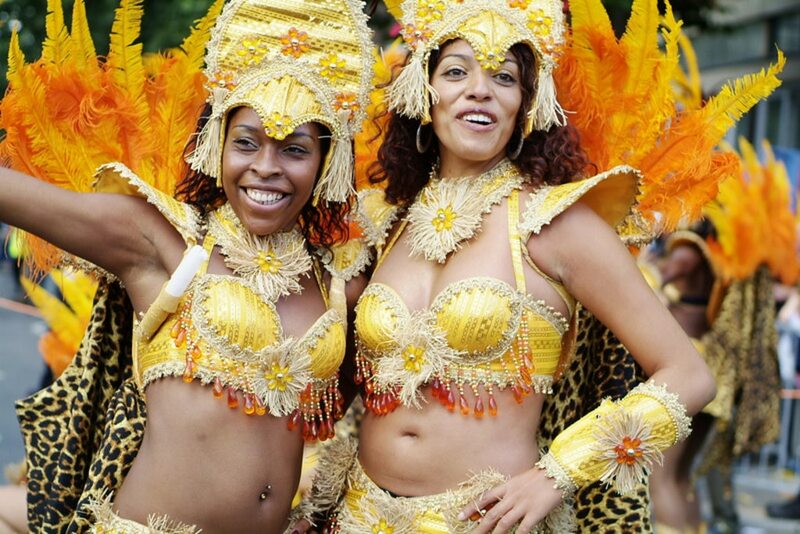 Notting Hill Carnival is one heck of a giant street party that has its pros and cons. The pro is that it's bloody awesome; packed full of great music and fun-loving people! The con is that it's packed full of people... don't expect to get reception on your phone in these crowds and don't expect to get home quickly as the queues to the tubes are insane. A small price to pay for a free party though! Don't go to the beginning of the parade, it's too crowded. Instead, find a place on the route where the dancers pass in the first 30 minutes and wait there. They will still be fresh, ready to pose for your pictures and you will have more personal space. Bring your own booze from home, try the jerk chicken (to die for!) and only go for the afternoon - leave before 6pm as it can get quite sketchy. Make sure to have lots of change with you, preferably £1/£2 coins, as it will make life easier buying food! 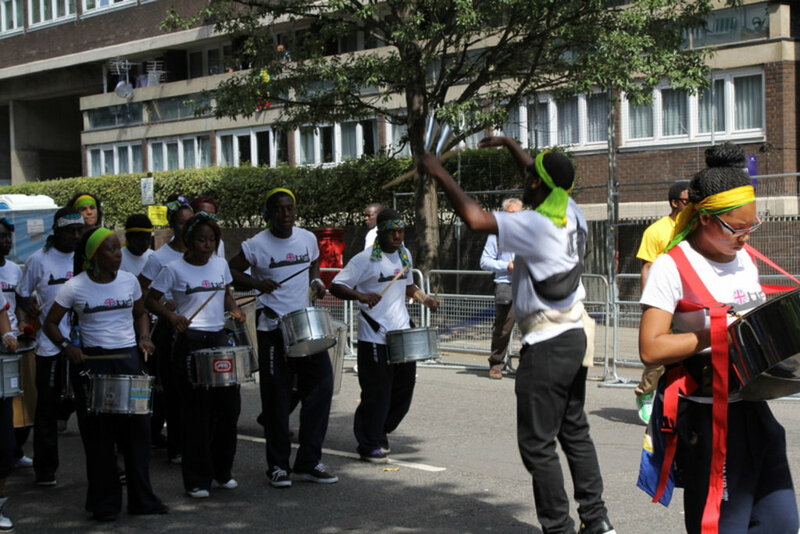 Ready to throw yourself into your first Notting Hill Carnival experience? Take the first step and check out our London hotels.